Here’s a fun way to put together a coffee table or side table vignette using children’s old toys. I used a large wooden tray as the base to bring it all together. You can use a serving tray, a cake stand, or whatever you choose. Just something flat to hold the snow. The snow is recycled shredded plastic, you could also run white computer paper through your shredder to use as snow. Now go round up one of your kids, or grand kids toy trucks and let’s get started. You can find the small wreath at any craft store for about a quarter. If you are having a hard time finding them, search the doll house section. I just used a dab of hot glue to attach the wreath. The Christmas tree in the back is a bottle brush tree and can be found at any Walmart or Dollar Store for a $1. Throw the tree in the back of the truck and you have created a cute vignette for around $2. Simple, yet cute and you didn’t break the bank. My boys have lots and lots of trucks and tractors, but not in that perfectly gorgeous shade of blue! That is one of my favourite vignettes! So pretty. I would have to put it up higher to keep it out of the way of our Lab’s wicked strong tail -we would have a snow storm indoors. Darling! Reminds me of one of our favorite Christmas family photo cards that we did. It was in my Dad’s antique truck. We put our live tree in the back, drove the truck into our grove, and all the kids piled in. It was so cute!!! Where oh where did you get the truck! I’d love to have that one. Very cute Dawn! I love the simple look. So cute, I love the color of blue on the truck! I’m pinning this, it’s so adorable! Good tip about snow making too. I hadn’t thought of using shredded paper! That is a super idea. My Dad just gave me a bunch of old cars in the boxes. I think yours made a fabulous Christmas display! I have been enjoying your series so far. Can’t wait to see what is next. 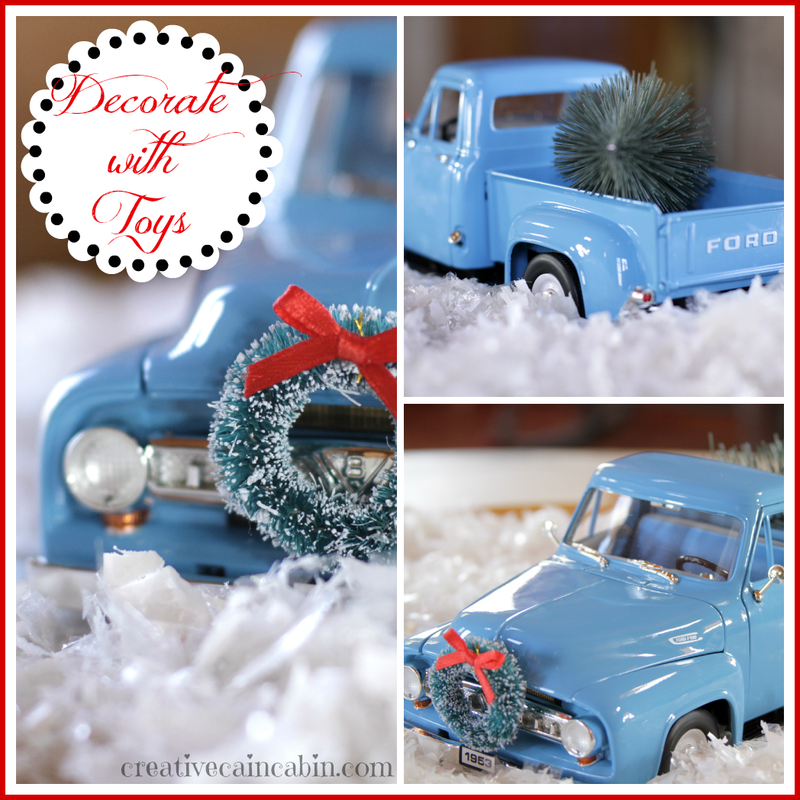 I love decorating with old toys any time of the year, and I love that old blue truck of yours. This is adorable Dawn and I love what you used for snow. Dawn I’m trying to catch up,I’ve been reading your other post. Love this bright blue Ford truck bringn’ home the Christmas tree.Such a cute idea using toys. 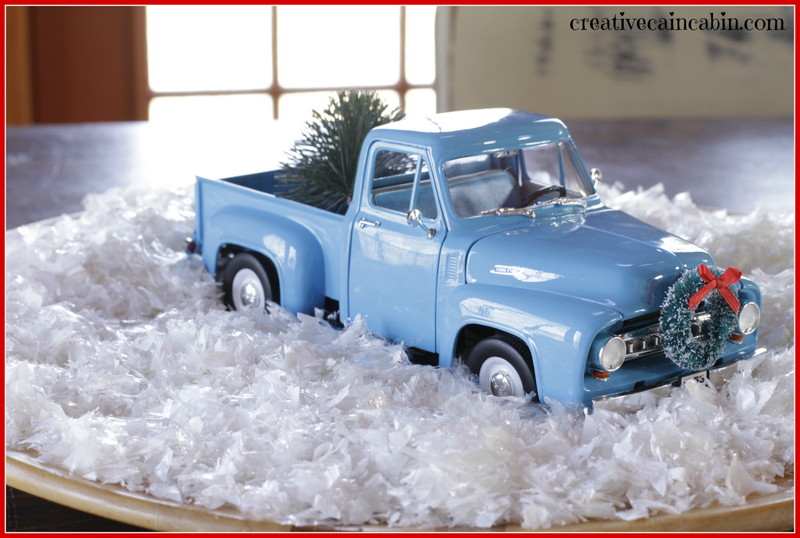 I loving this series:Christmas decor on a budget,excited to see what you do next! That’s really cute! I love the colors. I use to decorate my daughter’s dollhouse when she was younger. My dad decorates his train town. That is so cute dawn!! I love the tree in the back, and the wreath.It’s adorable. Love the color of that cute truck. A clever and economical vignette! That’s adorable, Dawn! 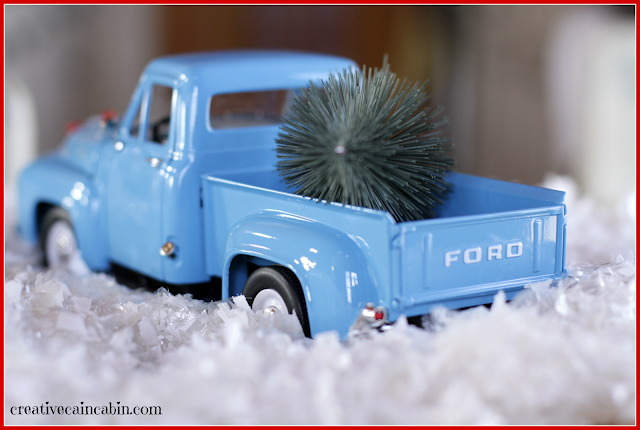 The Man has one of his toy trucks from when he was about five years old, and I used to use it to hold some bottle brush trees in a little vignette. This year, however, he is using it in the Man Cave for something else. Maybe I’ll go look at Good Will. This is sooo cute!! I’ll have to go dig out my sons’ little cars and trucks box of toys that I’ve been saving and try this. Great idea. I love your vignette, trucks are a very good idea. Oh. my. goodness. Cutest thing ever! 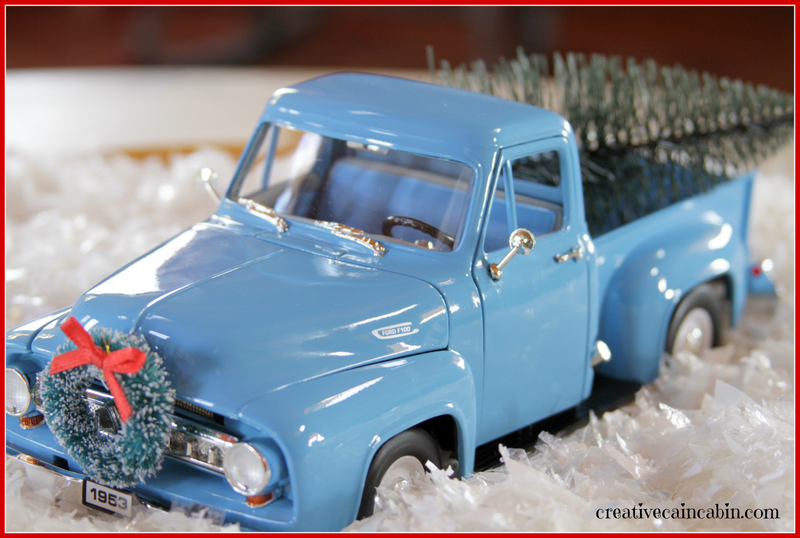 Love the little tree coming home in the back of the pickup! A reason to collect some toys I guess! 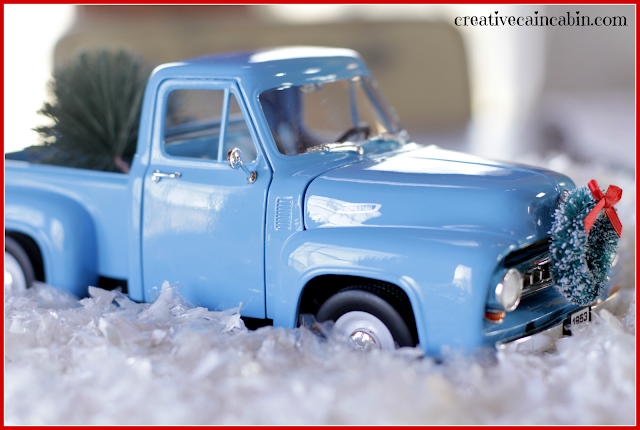 I love the toy truck, and I would love a real one too! Cutie pie – retro idea! 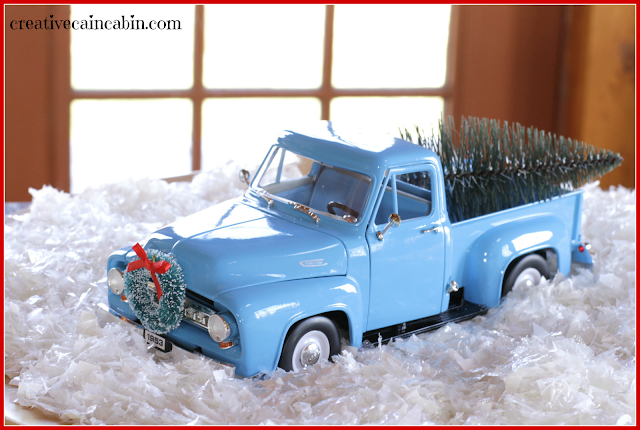 Love the pick up truck with bottle brush tree! It is so cute! So cute, Dawn and great pics. Very cute! Kids would have a blast doing this! That is one really sweet truck! Just found your blog and I’m now following along. Can’t wait to see more! So cute! 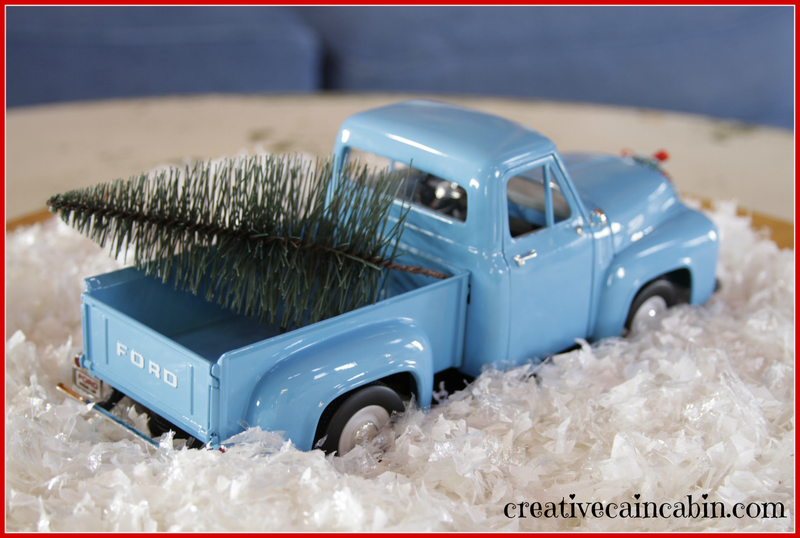 Love the tree in the back of the pickup! I love this idea!!! Thank you so much for sharing this at Rustic Restorations Weekend! So cute – I love the shade of blue in the truck. 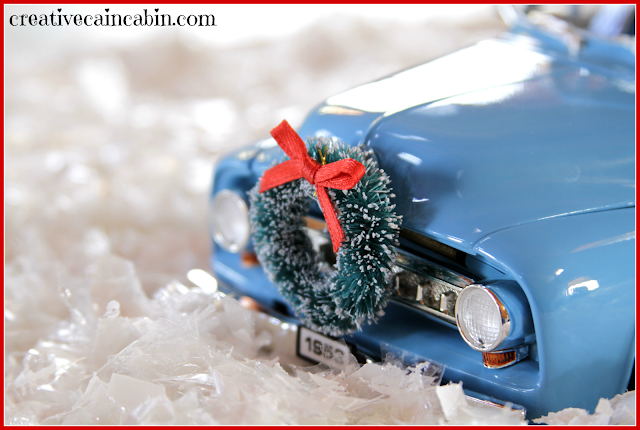 I’ve been wanting to make one of these, but haven’t had time to dig out the vintage truck/car we have. This is so cute. Love the blue truck. Wish I could have one in real life. Awesome idea to use plastic bag shreds as snow. I love the blue truck. Great idea. I found you through Knick of Time. 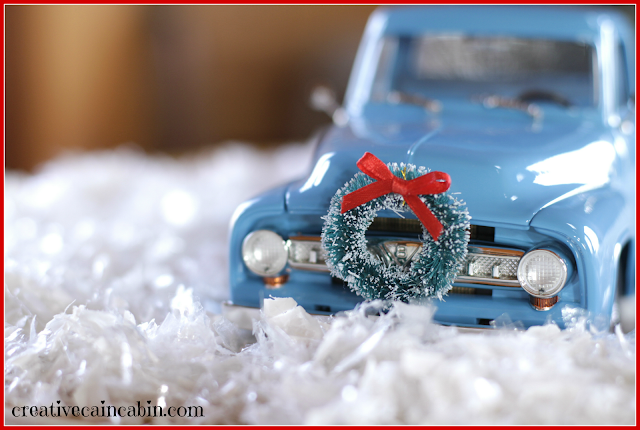 I love your little blue truck. Perfect with that tree in the back 🙂 Thanks for linking with me. Now that is a fabulous idea! So cute too! Now to find a little truck! Would love to find a blue truck like this one! Where is it from?